The newly constructed section of the east transit road, for which citizens of Banja Luka had been waiting for more than 30 years, was officially put into operation by Mayor Igor Radojicic, RS Prime Minister Zeljka Cvijanovic, and the executive manager of the public company „RS Roads“, Nenad Nesic. Thirty-two years ago the east transit road was planned to be a bypass road around Banja Luka and, together with the west transit, it was supposed to make up a ringroad. Today, it is not a bypass, but the city artery, and today we are getting a new city boulevard – Mayor Radojicic said. He said that, apart from the new section of the east transit, a new roundabout in Rebrovac city quarter was put into operation. He also added that the construction of a new bridge was about to start on the site of the old Green Bridge. These three capital projects will completely open up this part of the city and make faster traffic. They are of great significance not only to Starcevica and Obilicevo, and to the entire east part of the city, but also to those commuting via Rebrovac. Finally, it is of great significance to all citizens of Banja Luka, Radojicic stressed out. Apart from the afore-mentioned, Mayor announced the fourth huge project – connecting east transit road with the new Green Bridge. He thanked the Republic of Srpska Government and the company “The RS Roads“ for the given support in the implementation of the mentioned projects. RS PM Zeljka Cvijanovic said that Banja Luka had seen more investment in the last two years than before. 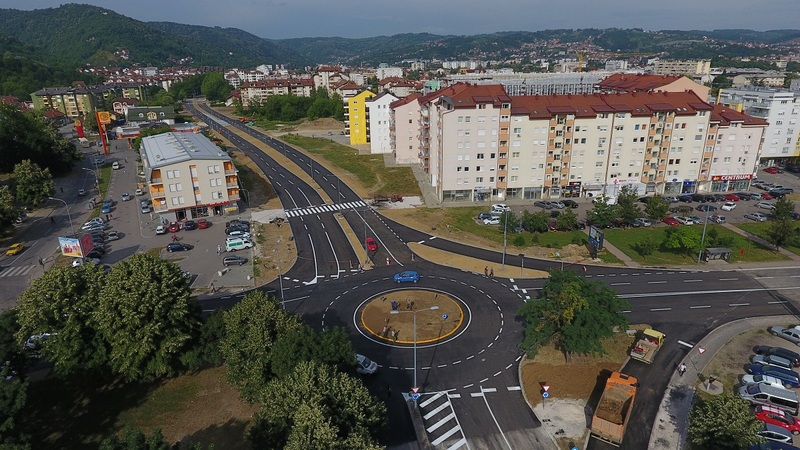 „The RS Roads“ executive manager, Nenad Nesic, said that the company, together with the RS Government and the City of Banja Luka, participated in the implementation of many projects in Banja Luka. He specified that it was a new section of the east transit road, 440 m long and priced at 805.000 BAM, and the Rebrovac roundabout, priced at 541.000 КМ. The works were financed by „The RS Roads“, and the City of Banja Luka provided required documentation and settled property and legal matters.